At 9.45 on the 21st of October, Rosalind and I arrived outside the Palace Theatre - me in my Hogwarts t-shirt; Rosalind with her Ravenclaw necklace and scarf on. 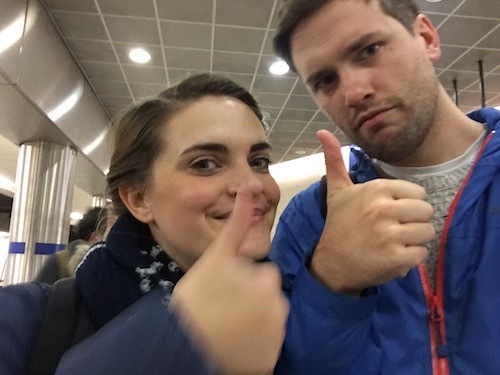 For we were going on a Harry Potter Themed Walking Tour of London. No-one was around when we first arrived, so we did want any sensible person would do - we sought out a second breakfast. When we emerged clutching our McDonald’s egg and cheese wraps, hash browns and bagels, a besunglassed man in a hoodie stood to one side of the theatre beckoning a small clutch of people over. We joined, he took our names - we were the last ones ticked off, though we were technically the first ones there - and we all gathered around. He introduced himself as Tom; and the tour began. We were put into houses by drawing cards out of a ‘sorting hat’. The hat was clearly faulty - I was sorted into Gryffindor when I’m clearly a Hufflepuff, I mean, my Patronus is a badger; Rosalind was sorted into Hufflepuff, despite being bedecked in Ravenclaw merch. But the reason for this sorting soon became clear: the tour contained a strong quizzing element with live scores tracked throughout. Slytherin raced into the lead by answering the first question. The competition was afoot. And so were we, as we headed to our first location. Now this was a walking tour and it did involve plenty of walking. Our first stop was probably my favourite of the tour. Apparently when she worked in London, J.K. Rowling would walk from Leicester Square to where she worked in Covent Garden, and to avoid the tourists and masses of people, she would walk through the back alleys on the way. We went down one which was full of independent bookshops. It struck me as kind of strange that there would be so many bookshops in one place, but then maybe not in the advent of the success of Harry Potter. These back alleys apparently provided the inspiration for Diagon and Knockturn Alleys. 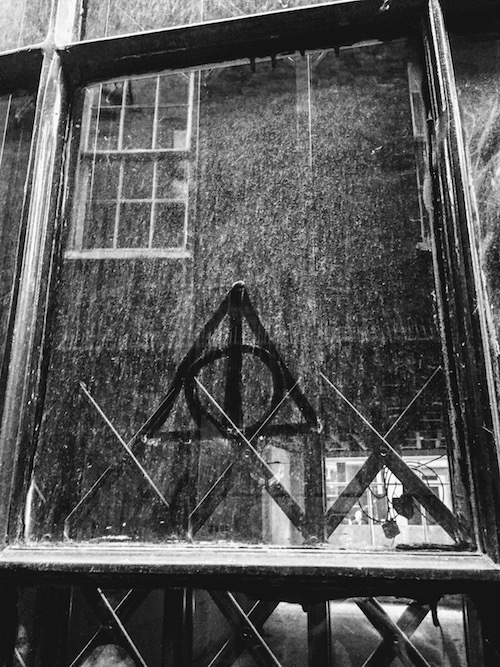 A mysterious deathly hallows symbol found down "Knockturn Alley". Our main complaint with the tour is that there’s just not that much cool Potter stuff in London. There are a few film locations - we crossed the Millennium Bridge; but the best thing about that was the chewing gum art which was at once cool and gross - and of course Platform 9 and 3/4s. But anyone who’s been to King’s Cross has seen the enormous queues there. That’s not the kind of thing I’m going on a Harry Potter tour for though. I’m going for the alleys that inspired her to write the books. And there were just too few of those sorts of places. An example of the chewing gum art we witnessed. Tom was a genial guide, but you know when he’s pointing out the Globe that material is thin on the ground. So all told, it was a little disappointing. But we still had fun and it was a beautiful day. We had two breakfasts - three including cereal bars and pieces of fruit - so can’t complain too much. Who won the quiz you say? Slytherin. After the lightning round it ended in a four-way tie. The guy from Slytherin who answered the first question correctly won the tie-breaker. But he had also won all the points for Slytherin. So fair play to him.